A fantastic way to celebrate a train lover's birthday! Our train cake pans are are made of commercial quality aluminum by industry leaders such as Wilton and NordicWare. Wilton is the number one preferred brand name in baking and cake decorating products. NordicWare, a family-owned company famous for its fine bakeware since 1946. Train shaped cake pans come with a sheet of instructions detailing gel colorings and tips you need to make the cake as pictured. Don't miss our full range of train cake pans & decoration section. 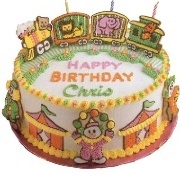 Also featured items like train cupcake topper, picks, edible cake images, train shaped birthday candles, cookie cutters, etc.